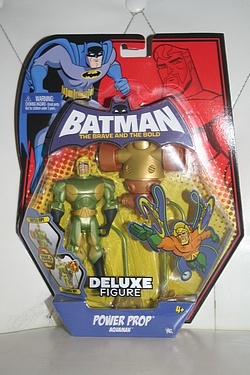 In this month's issue of Toyfair, the Batman: The Brave and the Bold line is finally getting some credit! Not only is the new wave of basic figures, including Joker and Plastic Man, being highlighted as rare and currently super-collectible, they are also generally being regarded as another fine product in Mattel's solid 2009 lineup. Let's check out Power Prop Aquaman today - one of the deluxe figures from the line. He comes with, yes, his Power Prop and is another great figure of the fantastically designed Aquaman in this line. Click the image below for more shots of this figure!